Founded in 1966, Self-Help for the Elderly is a community-based organization committed to promoting the independence, dignity, and self-worth of seniors. Each year the agency serves over 40,000 seniors in San Francisco, San Mateo, Santa Clara and Alameda Counties by providing a comprehensive range of multicultural and multilingual services to empower seniors to help themselves and others. Our vision is to be the premier provider of senior services in the San Francisco Bay Area with a commitment to excellence and achievement. Over 90% of our clients come from low-income minority community. We currently have nine service departments specializing in Adult Day Services, Health Insurance Counseling and Advocacy Program, licensed HomeCare & Hospice, Nutrition & Senior Centers, Residential Care Facilities for the Elderly, Senior Employment & Training, Senior Housing, Social Services and Technology Information & Empowerment. At Self-Help, we are firmly committed to the senior’s security, freedom, and peace of mind. If you enjoy working with seniors… if you believe in giving back to the community… if helping others makes you happy… come join us in making a difference together! Self-Help for the Elderly is an Equal Employment Opportunity/Affirmation Action Employer and we welcome diversity in the workplace. All qualified applicants will receive consideration for employment without regard to race, color, religion, gender, age, national origin, sexual orientation, disability, protected veteran status or any other characteristics protected by law. We participate in E-Verify. Qualified applicants with criminal history will be considered for employment in accordance with the San Francisco Fair Chance Ordinance. We may provide reasonable accommodations to applicants with disabilities. If you need a reasonable accommodation for any part of the application or hiring process, please email us at hr@selfhelpelderly.org or call (415) 677-7600 for special assistance. We offer a comprehensive benefits package including a multiple range of medical and dental plans, commuter benefits, flexible benefits plan, retirement plan, paid time off, paid holiday, and etc. Responsible for conducting trainings and workshops for seniors to learn to use computers and the Internet, and answers computer and technology related questions. Prepares and maintains lab area, equipment, and materials for trainings and workshops; operates and maintains audiovisual equipment; and maintains computers in the lab. Assists students with the use of hardware and software, and maintains training and workshop schedules and attendance records. Minimum Requirements: High school diploma; teaching and/or training experience preferred, current working knowledge of PC computer technology/equipment, smartphones, tablet computers, MS Office software applications, internet, online communication and social media platforms, excellent oral communication and interpersonal skills and ability to work with older adults as well as individuals from diverse cultural and socio-economic backgrounds, ability to effectively instruct senior learners on basic computer use and online programs using PC platforms. Must be bilingual in English and Chinese (Cantonese or Mandarin); biliterateracy in Chinese is a plus. Self-Help for the Elderly is seeking an Intake Coordinator responsible for food service programs and assist the intake and enrollment process of Adult Day Services. Qualifications: Bachelor’s degree in Business Administration or a related field; or high school diploma with a minimum of three years of office experience. Program/service management and supervisory experiences strongly preferred. Basic secretarial skills and knowledge of word processing (in English and Chinese), spreadsheet, and database. Accounting experience highly desirable. Bilingual in English and Cantonese. Must have TB clearance within 12 months prior to employment and maintain clearance annually thereafter. Must pass a strength test for physical fitness for the job: able to lift or carry up to 50 lbs. Must have and maintain valid CA driver license, satisfactory driving record, and auto insurance coverage as specified in Self-Help’s policy. Self-Help for the Elderly is seeking a Nursing Supervisor to oversee the Adult Day Services’ operation of the nursing discipline and ensures compliance with the program’s policies and procedures. Qualifications: Current California Licensed Registered Nurse with at least two years of management and supervisory experience in nursing or in a health care setting. Previous professional nursing experience working with the elderly or the chronically ill, or experience in home health, public health, or acute care preferred. Excellent verbal and written communication skills in English and Cantonese. Familiar with different patient transferring techniques. Must pass a strength test for physical fitness for the job: able to lift up to 40lbs from floor to waist level. Must have TB clearance within 12 months prior to employment and maintain clearance annually thereafter. Must acquire CPR and First Aid certificates within 6 months of employment and maintain current certificates thereafter. Self-Help for the Elderly is seeking an Administrative Assistant responsible for handling receptionist and administrative duties for Adult Day Services, such as answering phones, processing mail, tracking attendance, and etc. Qualifications: High school graduate with at least one year of receptionist and/or office administrative experience. Proficient in MS Office, Chinese Word Processing, and the internet. Bilingual in English and Cantonese. Able to lift, push and pull boxes up to 50lbs. Must have TB clearance within 12 months prior employment and maintain clearance annually thereafter. Instructs participants in a therapeutic regime to maximize function of body parts and muscles and to maximize endurance. Qualifications: Licensed by the California Board of Physical Therapist. 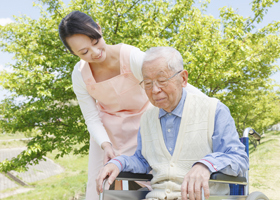 One year of experience working with the frail elderly or the chronically ill. Experience in home health, public health, or acute care and/or experience in working as a member of a multidisciplinary team highly preferred. Bilingual in English and Chinese preferred. Familiar with different patient transferring techniques. Must pass a strength test for physical fitness for the job: able to lift up to 401bs from floor to waist level. Must have TB clearance within 12 months prior to employment and maintain clearance annually thereafter. Must acquire CPR and First Aid certificates within 6 months of employment and maintain current certificates thereafter. Must be able to travel via public transportation or personal vehicle for performance of job duties. If driving, must have and maintain a valid CA driver license, satisfactory driving record, and auto insurance coverage as specified in Self-Help's policy. Responsible for providing counseling, consultation and training to staff and participants. Minimum qualifications: Must be a licensed psychiatrist, clinical psychologist, psychiatric licensed clinical social worker (LCSW), or psychiatric nurse (i.e., a registered nurse with a graduate degree in psychiatric nursing and one year of psychiatric nursing experience within the past five years, or a registered nurse with a baccalaureate degree in nursing and three years of psychiatric nursing experience in an acute psychiatric setting or a psychiatric health facility, one year of which should have been within the past five years). Self-Help for the Elderly is seeking a Registered Nurse to provide skilled nursing assessment, planning and care in order to maximize the comfort and health of Home Care patients and families. Qualifications: Current California Licensed Registered Nurse. Minimum one year professional nursing experience in home health, hospice, acute or sub-acute required. Ability to work both independently and as part of an interdisciplinary team. Current CPR certification. Must pass health screening for TB clearance, physical examination, and background check. Knowledgeable of OASIS. Bilingual in English and Cantonese. Mandarin & Toishanese a plus. Must be able to travel via public transportation or personal/department vehicle for performance of job duties. If driving, must have and maintain a valid CA driver license, satisfactory driving record, and auto insurance coverage as specified in Self-Help's policy. Self-Help for the Elderly is seeking a Career Advisor responsible for providing employment counseling, case management, WIOA eligibility determination, certification and assessment, training, placement, and retention services to program participants. Qualifications: Bachelor’s degree in social work, counseling, education or a related field or high school graduate with at least two years of relevant work experience. Previous work experience in a Neighborhood Access Point or Career Center, community services, career counseling and development, vocational training, human resources, WIOA funded program, and local and federal vocational training programs strongly preferred. Excellent written and verbal communication skills. Bilingual and bi-literate in English and Spanish, Chinese, Tagalog, Vietnamese or Russian is preferred. Must pass a background check. Performs non-medical Caregiver duties including companionship, housekeeping and personal care assistance to maximize the comfort of Self-Help for the Elderly clients. Qualifications: Minimum one year of experience as a Caregiver or related field, or completion of a Caregiver training program. English preferred. Cantonese, Mandarin & Toishanese a plus. Must pass a health screening for TB clearance. Must pass a background check. Must pass a strength test for physical fitness for the job: must be able to lift items up to 30 lbs; able to move heavy and bulky items up to 50 lbs during the course of cleaning. Must be able to travel within San Francisco via public transportation or personal automobile for the performance of his/her job duties. If using personal automobile, must have and maintain a valid CA driver license and automobile insurance as specified in Self-Help's policy. Monitors patient condition by observing physical and mental condition, intake and output, and exercise. Supports patients by providing housekeeping and laundry services; shopping for food and other household requirements; preparing and serving meals and snacks; running errands. Qualifications: Must be a graduate of Self-Help for the Elderly’s Home Health Aide Training Class. Must have a Home Health Aide Certificate issued by the California Department of Public Health. Ability to communicate in English preferred. Must have current CPR & First Aid certifications. Must pass a strength test for physical fitness for the job: must be able to lift items up to 30 lbs; able to move heavy and bulky items up to 50 lbs during the course of cleaning. Must be able to walk, sit and stand for 8 hours when required. Must pass health screening for TB clearance and background check. Must be able to travel via public transportation or personal/department vehicle for performance of job duties. If driving, must have and maintain a valid CA driver license, satisfactory driving record, and auto insurance coverage as specified in Self-Help's policy. Qualifications: Bachelor’s degree or equivalent training with a minimum of two years of experience working in senior services, preferably in a non-profit setting. Experience in counseling and/or working with volunteers preferred. Proficient in MS Office and the internet. Must complete HICAP counselor training and/or registration within 6 to 12 months of employment, depending on program needs. Knowledge of Medicare, Medi-Cal, Medigap, managed care, long-term care insurance and health care delivery systems preferred. Excellent verbal and written communication and interpersonal skills; and experience in group presentations. Bilingual in English and Chinese/Spanish preferred. Must have and maintain valid CA driver license, satisfactory driving record, and auto insurance coverage as specified in Self-Help’s policy. Self-Help for the Elderly is seeking a physical therapist responsible for providing physical therapy services and for adherence to all conditions outlined in the Service Employment Agreement. Qualifications: Possesses a degree from a baccalaureate or Masters program in physical therapy approved by an accredited organization. Meets personnel qualification stated in §418.114(b)(7). Licensed to practice as physical therapist within the state. At least two years of appropriate experience as a physical therapist. Home health/ hospice experience is preferred. Possesses and maintains current CPR certification. Must pass health screening for TB clearance, physical examination and background check. Must pass a strength test for physical fitness for the job: able to lift up to 40 lbs from floor to waist level. Bilingual in English and Chinese is a plus. Self-Help for the Elderly is seeking a Social Worker in its Home Care & Hospice department to assess the social and psychological needs of patients, and to develop plans of care to assist patients and their caregivers. It is currently anticipated that approximately 75% of time will be spent in HomeCare and 25% will be in Hospice. Qualifications: Candidates must possess a Master of Social Work degree from a school of social work accredited or approved by the Council on Social Work Education. Coursework in oncology, death, and grief counseling is preferred. Candidates must have a minimum of one year of social work experience in a health care setting. Home Health or Hospice experience a plus. Ideal candidates possess knowledge of chronic and acute disease and how it affects patient and family functioning. They will be comfortable working with families in crisis, the frail elderly, the disabled, and the terminally ill. They’ll be bilingual in English and Cantonese. Mandarin & Toishanese a plus. Self-Help for the Elderly is seeking a Medical Social Worker to provide case management services for a caseload of 17-22 clients. Qualifications: Master's degree in social work required with at least one year of experience working with disabled and/or elderly adults. Preference given to bilingual candidates who speak English plus Cantonese and/or Mandarin. Candidates must also be computer literate, able to lift 25 lbs, and detail-oriented. Provide spiritual care services to patients and their families, and hospice caregivers and staff, either directly or through coordination of care with other spiritual counselors. Develop and implement the bereavement plan of care. Qualifications: Graduate of accredited seminary or school of theology (BD, MDiv or equivalent theological degree), or degree in pastoral care. Comfortable in an interfaith setting, and able to accept different lifestyles, beliefs and values. Ability to network with community spiritual care leaders and places of worship. Must be comfortable with death and dying and providing spiritual guidance in a hospice setting either at home, or at a SNF or Board and Care home. Demonstrate excellent observation, problem solving, verbal and written communications. Must pass health screening for TB clearance, physical examination, and background check. Must be able to travel via public transportation or personal/department vehicle for performance of job duties. If driving, must have and maintain a valid CA driver license, satisfactory driving record, and auto insurance coverage as specified in Self-Help's policy. Bilingual in English and Chinese. Provides occupational therapy services to maximize the patient’s independence in activities of daily living by training them in motor, perceptual and cognitive skills. Qualifications: Licensed by the California Board of Occupational Therapy. Experience in home health, public health, or acute care preferred. Bilingual in English and Cantonese. Mandarin a plus. Current CPR Certification. Must pass health screening for TB clearance, physical examination and background check. Familiar with different patient transferring techniques. Must pass a strength test for physical fitness for the job: able to lift up to 40lbs from floor to waist level. Provides skilled nursing assessment, planning and care in order to maximize the comfort and health of Home Care patients and families. Qualifications: Current California Licensed Registered Nurse with minimum one year professional nursing experience in home health, hospice, acute or subacute required. Current CPR certification. Must pass health screening for TB clearance, physical examination, and background check. Knowledgeable of OASIS. Bilingual in English and Cantonese. Mandarin & Toishanese a plus. Provides skilled nursing assessment, planning and care in order to maximize the comfort and health of Hospice patients and families. Qualifications: Must be currently licensed by the CA Board of Registered Nurses with minimum one year professional nursing experience in home health, hospice, acute or subacute care. Experience with oncology or hospice preferred. Must be able to cope with patient and family emotional stress and be tolerant of individual lifestyles without judgment. Currently CPR Certified. Must pass health screening for TB clearance, physical examination and background check. Computer proficiency in Microsoft Office 365, and ability to use electronic health record software. Knowledgeable of Medicare regulations. Bilingual in English and Cantonese. Mandarin & Toishanese a plus. Responsible for providing skilled nursing assessment, planning and care in order to maximize the comfort and health of Hospice patients and families. Assesses and identifies patient and/or family needs and provides appropriate physical and emotional support in accordance with physician’s orders and plan of care. Responsible for developing, evaluating, and revising patient’s individualized plan of care in collaboration with Hospice and Palliative Medicine Physician and Director of Patient Care Services, and other members of the Interdisciplinary Group and patient’s primary care physician. Minimum Qualifications: Must be currently licensed by the CA Board of Registered Nurses and bilingual in English and Cantonese, with Mandarin & Taishanese as a plus. Must be able to cope with patient and family emotional stress and be tolerant of individual lifestyles without judgment and currently CPR certified. Performs the nursing care plan as directed by the Registered Nurse to maximize the comfort and health of Home Care patients and families. Minimum Qualifications: Current California Licensed Vocational Nurse and at least one year professional nursing experience in home health, hospice, acute or sub-acute preferred. Bilingual in English and Cantonese preferred. Mandarin & Toishanese a plus. The speech–language pathologist, contracted or employed, is responsible for implementation of standards of care for speech language pathology services and for adherence to all conditions in the Service Agreement. Minimum Qualifications: Possesses a degree that includes an internship from an approved Master program in Speech- Language Pathology, or as required by applicable law and/or regulation. Meets personnel qualifications stated in §418.114(b)(4). A minimum of one year clinical experience in Speech–Language Pathology. Self-Help for the Elderly is seeking a Director of Nutrition & Senior Centers responsible for the overall program management, supervision and quality assurance for the agency’s senior center and programs in San Francisco. Qualifications: Bachelor’s degree in nutrition, social work, human services, business administration or a related field; master’s degree strongly preferred. Five years of experience working with older adults in a senior center or social service setting, and three years of program administration/management experience required.Must be bilingual in English and Cantonese. Must be available to work evenings or weekends as needed. Proficient in MS Office and the internet. Must have and maintain a valid CA driver license, satisfactory driving record, and auto insurance coverage as specified in Self-Help’s policy. Self-Help for the Elderly is seeking a Community Service Manager responsible for the overall planning, development and coordination of activities and fundraising events, and the supervision of Program Assistants and volunteers. Qualifications: Bachelor’s degree in Recreation, Liberal Arts or a Human Services field; or college education with a minimum of three years of work experience in implementing social, recreational or educational activities with older adults. Must be bilingual and biliterate in English and Chinese (Cantonese and Mandarin) and able to demonstrate cultural awareness. Must be able to work weekends. Must pass health screening for TB clearance. Must obtain First Aid and CPR certificates by the end of the 3-month introductory period. Must have and maintain valid CA driver license, satisfactory driving record, and automobile insurance as specified in Self Help’s policy. Self-Help for the Elderly is seeking a Home Delivery Driver to deliver meals to congregate meal sites and home delivery program participants. Qualifications: At least two years of work experience required. High school graduate preferred. Experience working with the elderly and/or food service preferred. Must have and maintain a valid CA driver license. Minimum of two years of driving experience with satisfactory driving record. Must have interest to work with seniors and adults with disabilities and be willing and able to climb stairs to the homes of clients. Bilingual in English and Chinese. Must pass a strength test for physical fitness for the job; able to lift and/or carry up to 50 pounds. Must pass a drug test. Self-Help for the Elderly is seeking a Meal Site/Home Delivery Worker to provide food services and performs other duties at the senior center. Qualifications: Minimum one year of experience in community and food service. Experience in food production or catering, preferred. Must be bilingual in English and Chinese. Good communication skills. Must pass a strength test for physical fitness for the job: ability to lift up to 50 pounds. Must pass health screening for TB clearance. Must obtain certification in food safety (ServSafe) within 3 months from the date of employment. Minimum Qualifications: At least two years of work experience required. Experience working with the elderly preferred. Must have and maintain a valid CA Commercial Class B driver license. Minimum of two years of driving experience with satisfactory driving record. Self-Help for the Elderly is seeking a Program Assistant to provide assistance to SF Pathways to Citizenship Initiative Project, and assist Citizenship Program related tasks. Function as Citizenship class instructor when classes become available. Report to Naturalization Program Supervisor for Citizenship Program related matters. Qualifications: College education with one year of relevant experience. Sensitive to the needs of the elderly and to diverse ethnic and minority cultures. Bilingual in English and Cantonese, Mandarin or other languages a plus. Self-Help for the Elderly is seeking a Peer Ambassador to conduct outreach activities and disseminate information about DAAS-funded programs and services to organizations and individuals, including non-profits, faith-based organizations, businesses, health care providers, housing site coordinators and individuals who have contact with older adults and/or adults with disabilities living in the community. Qualifications: Sensitive to the needs of seniors and adults with disabilities from diverse ethnic and minority cultures. Bilingual and bi-literate in English and Chinese (Cantonese and/or Mandarin). Must be able to travel via public transportation or personal vehicle for performance of job duties. If driving, must have and maintain a valid CA driver license, satisfactory driving record, and auto insurance coverage as specified in Self-Help's policy. To apply: Please click on the job title to complete an online application. For more information: Contact Human Resources Department at HR@selfhelpelderly.org.